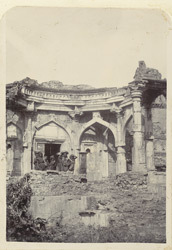 Photograph of the Mosque of Malik Mughis at Mandu, Madhya Pradesh, taken by an unknown photographer in c.1902. The mosque is one of the buildings grouped around the Sagar Talao lake and dates from c.1432. It was constructed using masonry salvaged from local Hindu temples and was originally decorated with tile mosaic and Islamic calligraphy. It is one of three mosques at Mandu all dating from the 15th century; the others being the mosque of Dilawar Khan, the oldest Islamic building at Mandu, and the majestic Jami Masjid. This is a view of the entrance porch, which projects from the front and would have been roofed with a dome which has fallen. With nearby Dhar, Mandu was the centre of an important provincial style of Islamic architecture characterised by an elegant and powerful simplicity that is believed to have influenced later Mughal architecture at Agra and Delhi. Mandu is a historic ruined hillfort and stands in a spectacular naturally-defended position on an elevated plateau of the Vindhya hills, surrounded by a deep ravine. An ancient stronghold, it first came to prominence under the Paramara dynasty at the end of the 10th century, and remained under Hindu rule until the early 14th century when it was conquered by the Sultans of Delhi. Its golden age came as the capital of the Sultans of Malwa between 1405 and 1531. They renamed the fort ‘Shadiabad’ (City of Joy) and built palaces, mosques and tombs amid the gardens, lakes and woodland within its walls. Most of the remaining buildings date from this period and were originally decorated with glazed tiles and inlaid coloured stone.